Octave Chanute was an engineer and builder from Chicago who in the late 19th century constructed some of the most important bridges in the central United States. He also designed and built the Chicago Stock Yards. 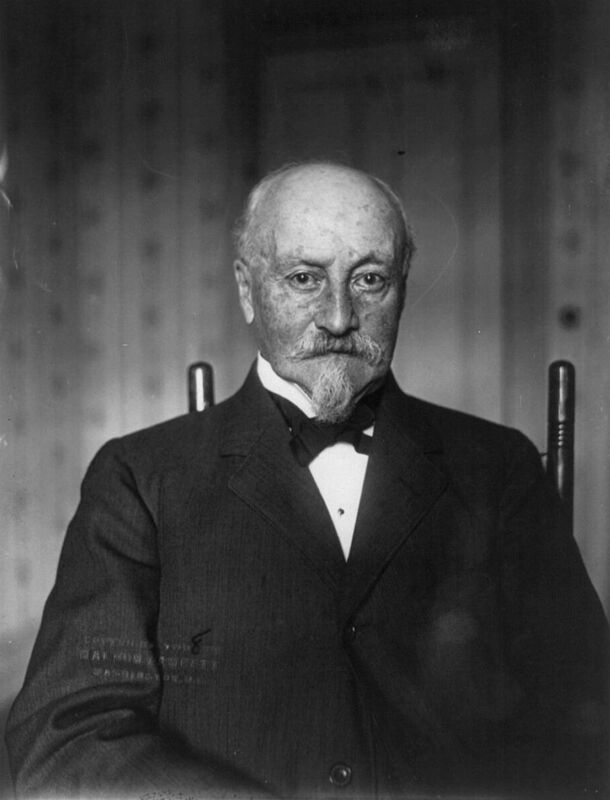 Chanute would hold eight U.S. patents during his lifetime. When he retired from bridge building he began to dabble in aviation. Chanute helped lead a conference on aviation as part of the Chicago World’s Fair in 1893. He applied his engineering expertise to reviews of existing data from aviation experiments and wrote a book, Progress in Flying Machines, in 1894. Chanute made important discoveries about some of the principles of aerodynamics with a series of test flights of a glider from the shore of Lake Michigan in the summer of 1896. One of his innovations was a design which would increase the amount of lift generated by an aircraft by adding a second set of wings above the first: the concept of a biplane. A few years later, Chanute’s book and his subsequent work caught the attention of Wilbur Wright, who with his brother Orville was then engaged in the experiment which would lead to the first airplane flight at Kitty Hawk in 1903. Starting in 1900, Chanute acted as an advisor and publicist for the Wrights. He was the first president of the Aero Club of Illinois in the months before he died in Chicago in 1910. In the 1970s, Chanute was honored with U.S. Postal Service airmail stamp. In April 1917, as the United States prepared to enter World War I, the War Department established a series of air service training schools around the country. One of the sites selected was a piece of flat ground near Rantoul, Illinois, not far from both the Illinois Central Railroad and the University of Illinois. By July, Chanute Field was operating as a training base, preparing American pilots for combat in Europe. The facility would become Chanute Air Force Base and serve as a training facility through the end of the Cold War. 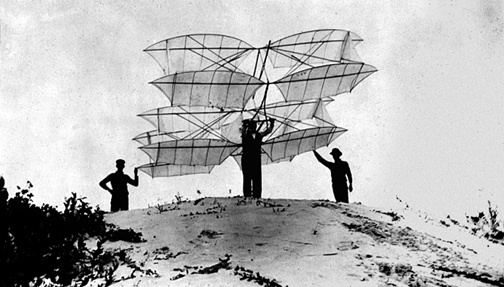 In the early days of flight, aviation was mostly an exhibition rather than a means of travel. Barnstormers and sportsmen took to the air in flying circuses around the nation. The first recorded airplane flight in Illinois occurred in October 1909 when another aviation pioneer, Glenn Curtiss, took off in a plane called the Golden Flyer at the Hawthorne Race Course in Cicero. His 40-second flight reached an altitude of 60 feet. A year later, H.H. Kohlsaat, the publisher of the Chicago Record-Herald offered a $10,000 prize for the first pilot to make a flight from Chicago to Springfield. Walter Brookins claimed the prize with panache: landing in Springfield on the first day of the 1910 State Fair, just seven hours and twenty minutes after leaving Chicago, and with only two stops in between. The next year, Grant Park hosted a flying exhibition in which pilots would earn two dollars for every minute they kept their plane in the air between 3:30 p.m. and 7 p.m. on each of the nine days of the festival. Collectively, the pilots kept their planes airborne for 206 hours. Two pilots were killed. After the war, with Army-trained pilots and military surplus planes both in abundance, barnstorming really took off. Though pilots would offer to take passengers on short rides between towns for a small fee, there still was not a market for commercial aviation just yet. One entity that did take notice of the small planes zooming in and out of every town with a strip of flat ground was the United States Post Office Department, forerunner of today’s U.S. Postal Service. Charles Lindbergh’s plane at Conkling Field in Springfield. In 1918, the U.S. Air Mail service was formally introduced, after several years of trying. Routes were established between large cities and small towns throughout the country, and contracts were issued to various airplane companies to fly the routes and deliver the mail. One of these companies was the St. Louis-based Robertson Aircraft Corporation, which won the contract for the St. Louis to Chicago route. The route included stops in both Springfield and Peoria. Robertson began hiring pilots for the new airmail route. One such pilot was a barnstormer named Charles A. Lindbergh, who in April 1926 began delivering the mail in his deHavilland DH-4 biplane. Lindbergh’s career as an air mail pilot got off to a rough start. 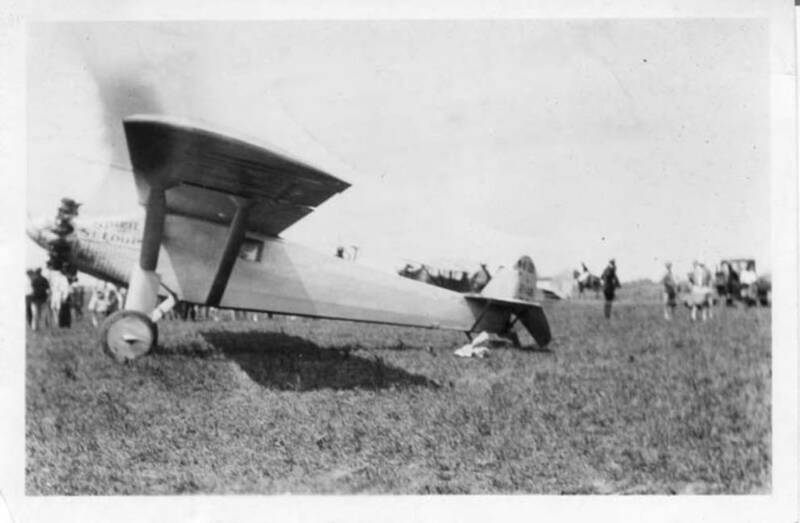 On two different occasions, while attempting to land in fog in Maywood, he experienced mechanical trouble and had to bail out of his plane, parachuting to safety. Unhurt, he found the wreckage of his plane and made his delivery both times. In September, he was forced to land in a farmer’s field north of Springfield, staying overnight in the farmhouse and delivering the mail the next day. The site was marked with a historic marker plaque in 2007. Just a few months after putting his plane down in that farm field near Athens, Lindbergh would line up some local St. Louis investors to finance his new plane “Spirit of St. Louis” for the first ever non-stop flight from New York to Paris. He became an instant worldwide celebrity for his daring feat. But he did not forget his Illinois roots: on a goodwill flight around the nation in August 1927, Lindbergh brought the Spirit of St. Louis back to his old Springfield airstrip. In Springfield, Lindbergh’s stop was known as Bosa Field, for the farmer who gave the land near Bradfordton west of the city for the airfield. It was later called Springfield Airport and then Conkling Field, after the local postmaster. Later, it would carry the name of its most famous visitor when it was renamed Lindbergh Field. Lindbergh’s original landing field no longer exists: it is now all farmland. Its former location is marked by a plaque placed by local boy scouts in 1995. Amelia Earhart at Municipal Airport in Springfield, 1934. Ironically, the airfield in Springfield most commonly associated with Lindbergh is one at which he might never have landed. Not long after Bosa Field became Lindbergh Field, in 1928, operations were moved to the new Springfield Municipal Airport, later named Southwest Airport. It was about three miles to the southwest of the State Capitol building. Today, Southwest Airport is long gone and the area is mostly residential. The street running through part of the old airport property is named Lindbergh Boulevard. Though Lindbergh may never have made it to the newer airfield, at least one famed aviator did. 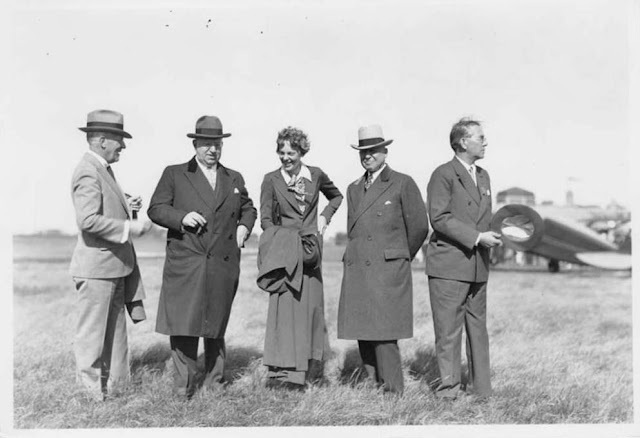 In October 1934, Governor Henry Horner greeted Amelia Earhart there when she visited the capital city. Boxed in by a railroad and a state highway, Southwest Airport could not be expanded to accommodate the larger planes which were taking to the air by the 1940s, and so Springfield’s current airport, now called Abraham Lincoln Capital Airport, was built and opened in 1947. After Lindbergh’s flight, the nation became enthralled with flight. Many other Illinoisans would play important roles in the development of aviation, including Merrill C. Meigs, Oliver L. Parks, and U.S. Navy Lieutenant Edward H. (Butch) O’Hare. By the early 1930s, larger airplanes and public enthusiasm made it possible (and profitable) to add passenger service to the mail flights between major cities. The Chicago to San Francisco mail route was flown by Boeing Air Transport, which later merged with several other aviation companies to form United Air Lines. Today, Chicago-based Boeing is one of the largest aircraft manufacturers in the world, and Chicago-based United is the third largest airline in the world. 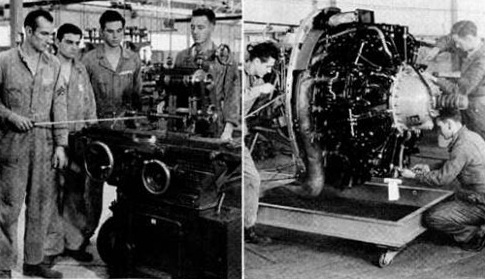 Thousands of Illinoisans are employed in the aviation industry, which got its start in large part thanks to an engineer and a barnstormer.